This is a hearty yet healthy soup to warm up those cold winter days - and it couldn't be easier to make! Serve this as a perfect starter for a winter dinner or for lunch on a snowy day! 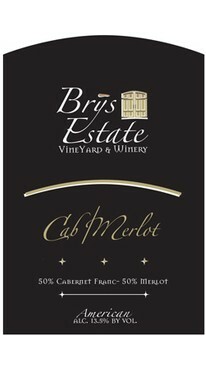 This soup pairs beautifully with a good sized glass of our Cab/Merlot blend! Place the prepared cauliflower, potato and onion on a large sheet pan. Drizzle with olive oil and sprinkle with salt. Toss. Place sheet pan in the oven and roast for 30-40 minutes (turning once) until the cauliflower is nicely browned. Transfer vegetables to a large soup pot. Add chicken stock and bring to a boil. Cover and simmer for 20-30 minutes until the vegetables are soft. Using an immersion blender (one of my favorite kitchen gadgets), puree soup. If you don't have an immersion blender you can always puree the soup in batches in a traditional blender or food processor. Once pureed, add cream, 1 1/2 to 2 tsp salt (depending on the chicken stock you use) and 3/4 tsp pepper and stir to combine. If the soup is too thick add additional chicken stock to thin. Serve garnished with fresh made croutons. 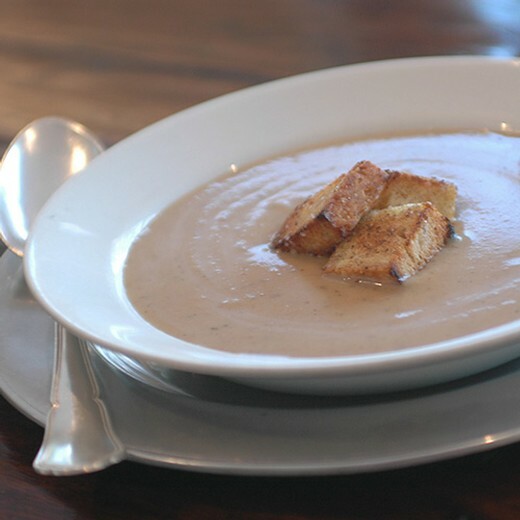 To make the croutons cut up bread of your choice (for this soup I prefer pumpernickel or multi-grain) in large chunks, toss with a little olive oil, salt and pepper then cook in a large skillet over medium heat until browned and crispy on all sides.